Like honey? Then you’ll want to try these three our gourmet honey mustard dips from award-winning specialty food producer Robert Rothschild. There’s Raspberry Honey Mustard Pretzel Dip, Blackberry Honey Mustard Pretzel Dip, Honey Chipotle Pretzel Dip and for “dessert,” a Raspberry Chocolate Pretzel Dip. 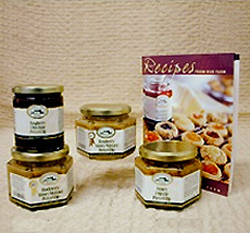 Also included is a book of exciting recipes, in case you’d like to do more with your honey mustards than dip pretzels. (The dips are certified kosher.) Take the quiz and you’ll find out fun facts about honey. Take the quiz here—you don’t have to answer correctly to win. If you’re a trivia lover, all of the quizzes from our prior Gourmet Giveaways are available for your enjoyment. You could this set of gourmet honey mustards/dips—correct answers not required.